Courtesy of WWE.com: With the release of the highly anticipated “WWE 2K19” on Oct. 9, join us on a pixelated journey through the history of sports-entertainment video games from the finest arcade action to the 8-bit glory of Nintendo to the mind-blowing graphics of today in this grapplin’ gaming retrospective. 1983: Tag Team Wrestling (Arcade) – Documentation on the early days of squared circle video games is hard to come by, but “Tag Team” is believed to be the first such genre title. Right out of the gate, this grappling game (which also appeared under the name “The Big Pro Wrestling”) featured tag teams and sweet outside-the-ring battles, offering greater playability than other sports and fighting games of the era. 1987: Pro Wrestling (Nintendo Entertainment System home video game, or NES for short) – A beloved classic for every ’80s graps fan, “Pro Wrestling” couldn’t offer the ability to play as ring legends like Ric Flair and Abdullah the Butcher, but it managed to create some 8-bit icons all the same with its memorable cast of characters, including King Slender, Star Man and The Amazon. People still play NES for this title, and nothing gets a controller flung quicker than a spin kick from Kin Com Karn. 1989: WWE WrestleMania (NES) – The first officially licensed WWE video game, this title debuted on NES and featured 8-bit Superstars that somewhat resembled Andre the Giant, Hulk Hogan and Honky Tonk Man. In a genre first, players could unlock a “Rage” mode during beatdowns and “Hulk ups.” Most notably, the game featured Superstars’ official entrance music. Sing it with us: When it comes crashing down and it hurts inside! 1989: WWE SuperStars (Arcade) – This game was the first to boast character models that looked and moved like real-life Superstars. WWE Superstars even appeared to conduct interviews for the first time, with memorable cutscenes featuring “The Million Dollar Man” Ted DiBiase, Virgil, Andre the Giant, “Mean” Gene Okerlund, “Macho Man” Randy Savage and Miss Elizabeth. 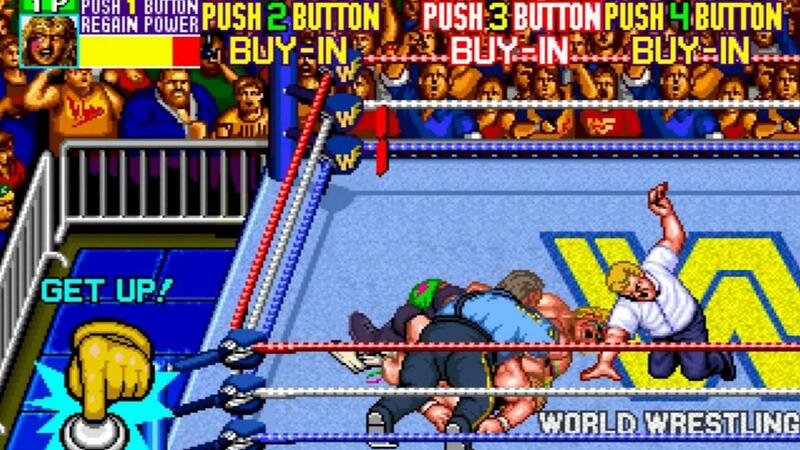 1991: WWE Wrestlefest (Arcade) – One of the most popular and recognizable WWE arcade games ever, “WrestleFest” rocked a Steel Cage Match, awesome graphics, a revolutionary grappling system and the first Royal Rumble mode, which let four players lock horns at once. However, one of the game’s biggest caveats was the need to have quarters ready for players to replenish energy mid-match. In 2012, “WrestleFest” made a return as downloadable app featuring modern WWE Superstars but keeping the same spirit of the original game. Check out the rest of the list here, along with screenshots of the fun games!